Apple iPhone 8 Plus is so far among the best phones to buy in Kenya especially if you need a smartphone with a powerful camera, humongous internal memory and elegant look. The current price of this phone is Ksh 139,999 at Jumia and over Ksh 145,000 at Safaricom. But, what makes this phone so expensive? Here is the reason. Apple is currently ranked the second most powerful brand in the world that is after Google. Apple products, which include iPhone smartphones are of the best quality and are accepted world over. When you purchase a phone manufactured by Apple, you are sure it won’t disappoint. 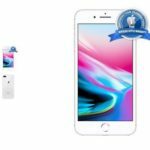 Currently, many apple users confess that iPhone 8 Plus is even better than iPhone X,the company’s latest phone. This is why the price of the former has failed to go down steeply. You will notice that iPhone 8 Plus is one of the few phones capable of taking 4K videos—this is amazing.Besides,it contains 256GB of internal memory. The phone is also water and dust resistant.